ABACC is conducting training courses for its inspectors on Short Notice Random Inspection (SNRI) for manufacturing plants. 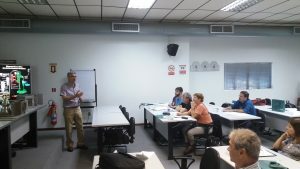 In Brazil, the training is being carried out at the Nuclear Industries of Brazil (INB) facility in Resende, on September 13 – 15, 2017, with the cooperation of CNEN, INB and IAEA. In Argentina, the course will be held at the factory of Combustibles Nucleares Argentinos – CONUAR, in Ezeiza, on September 18 – 21, 2017, with the cooperation of ARN, CONUAR and IAEA.